SpongeBob: Bikini Bottom pet show today! Good thing I put those notes there, otherwise I could have forgotten. And I wouldn't want to do that because the Bikini Bottom pet show is where you gotta go to see the best pets in town. Not that any other pet can take a chance against my buddy Gary. He's the bestest pet in the whole world. Love you, Gare bear. (watch beeps) Whoa-oh, the show starts in an hour! Hey, Gare, time to... Gary? (falls on his face) Whoa! Gary! Gary? Gary? Gary? Perch Perkins: Looks like another beautiful day here in Bikini Bottom. It... Huh? SpongeBob: (walks onto set where the Perch is doing his newscast from) Gary? 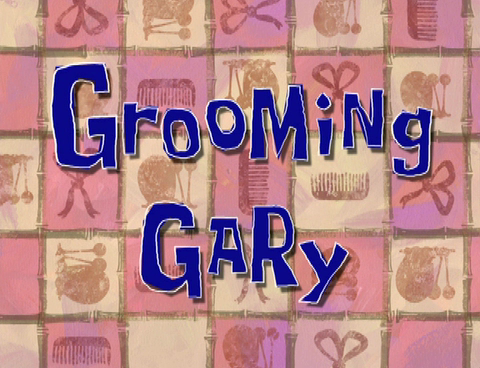 (gasps from coming out of Squidward's bathtub) Gary? Oh, hi ya, Squidward. (Squidward kick him through the window. SpongeBob screams) Gary! Gary? Gary? Gary, there you are. What are you doing here when today is the day we get to show everyone else you're the best pet in the whole world. Now for a quick checklist. Let's see. Eye stalk reflexes. Check. Slime viscosity. (SpongeBob drags the slime around his house and into Squidward's house) Hi, Squidward. Ready! (Squidward gets stuck on SpongeBob's wall) Hi again, Squidward. Lady Fish #1: Stand up straight. Posture is everything in appearance. Male Fish #1: Roll over. Male Fish #2: Your newly trimmed hairstyles highlight your regality. SpongeBob: Huh. People sure seem to treat their pets differently here. Charles: That's a good boy, Foofie. Look at your luxurious mane. Every self-respecting snail has one. Charles: Ah, yes. How could I forget? Accessories. Your diamond-studded leash? SpongeBob: I always use an old rope. I guess that's not good enough. Charles: Of course, there's the cherry on the beauty cake-- the glossy painted shell. And last, but not least, well maintained oral hygiene. Just look at your pearly whites. Charles: Anyways, we best run along, Foofs. Your pedicure is in half an hour. SpongeBob: Pedicure? Ooh. I don't realize how much went into this. SpongeBob: Oh, don't be so protective of me, Gary. I know I've been a horrible parent. But no longer. From this moment on forth, I vow to give my Gary the most upmost frivolity. To live by the standards of snail grooming set forth by: that guy. SpongeBob: Enough dillydallying. We got to get down to business. SpongeBob: And the piece de resistance. Glow-in-the-dark paint. Hey, where you going? Gary, wait. We got to go back to the pet show! SpongeBob: Because. We gotta show those other pets that you are just as fancy as they are. (Gary spits raspberries) Oh, come on, Gary, don't be this way. I'm doing it for you, not me. SpongeBob: That's what I like to hear, because I can bring this out-- your very own studded collar with two rows of diamonds. Here. Try it on. (puts it's around Gary's neck) Now, let's get back out there and knock them out of their shells! Patrick: Hey, SpongeBob, whatcha doing? SpongeBob: Patrick, I'm so glad you just happened to show up. Help me. (whispers something to Patrick. Gary tries to get away but they both grab him and put him into a bathtub. Patrick opens Gary's mouth so SpongeBob can brush his teeth) Gary, stop it! I'm only doing this because I love you. (cut to later where SpongeBob and Patrick are walking Gary down the street) Gary, look. It's him. Charles: Come, now, Foof. Keep your tail up, up, up. SpongeBob: Hello! Sorry to bother you. Just wanted to get your opinion on my snail, Gary. SpongeBob: This is it, Gary. This is our time to shine. (cut to Patrick, SpongeBob, and Gary walking around the Pet Show) Wow, Patrick. There's a whole lot of pet loving going on around here today. Patrick: Yeah. You and Gary don't have a chance. Store owner: Excuse me, sir, but all non-pet owners must remain behind this rope. Patrick: Now what am I gonna do? I'm all alone behind this rope! SpongeBob: Patrick, I'm right here. SpongeBob: Don't worry, Gary. He'll be back in time to see us win first place. Now let's go scope out the competition. Male Fish #3: There it is, Mrs. Squiggles-- your new hairdo. SpongeBob: Hmm. Maybe you need some shades, huh, Gare? (Gary is eating the leash) Silly boy, you're not supposed to eat the leash. SpongeBob: Boy these pets are gussied up today. Maybe you need a top hat or something to class it up a bit. Gary. Oh, thanks for reminding me. I didn't know your collar was loose. (SpongeBob tightens the leash, which makes Gary squeal) Now, let's go get that top hat, Buddy. (Gary tries to stay put but SpongeBob puts him on top of his head) There ya go. Judge: All right, let's see. (examines each snail) Uh-uh. Decent Stalk Length. Ooh, good hinge action. Oh, Foofie. Excellent brow stretch. Well-defined eyelid capillaries. Foofie is looking as good as ever, Charles. Charles: Why, thank you, sir. Judge: (moves onto Gary) Okay, let's take a look-see, shall we? Ah, yes. Good space on the larynx. Nice gastric chamber. All within breed description. SpongeBob: It's in the bag! SpongeBob: Gary! No! Gary, you spit him out right now. I'm sorry, he usually bites me. Male Fish #4: Muffsies, you look angry. Lady Fish #2: What's going on? Charles: What a hideous display. At least I know you'd never behave like these heathens, right, Foofie? (Foofie snarls) Foofie? Foofie! Charles: Foofie, what have you done?! Charles: What's this about? Does anyone speak snail? SpongeBob: You were trying to tell me that all along, weren't you, Gary? SpongeBob: Well, I won't let it happen again. SpongeBob: Did you hear that, Gary? They're rewarding you for standing up and speaking out against injustice. Maybe these pageants aren't so superficial after all. Judge: What are you talking about? The snail didn't win. I was referring to your other pet. He's so adorable.